Singha Park is owned by Boon Rawd Brewery, the company who produce Singha Beer, but visitors hoping to find a brewery and endless supplies of Thai beer are out of luck. 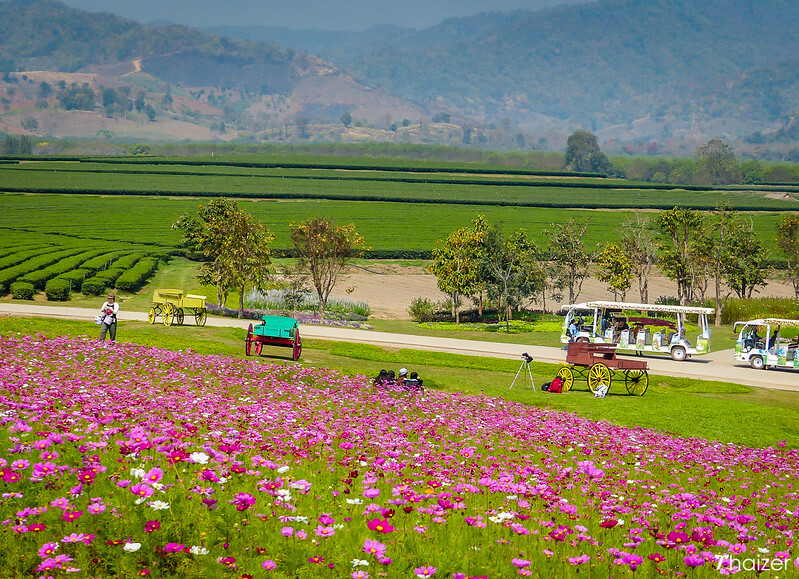 Instead, the picturesque park in the Chiang Rai countryside is a family-friendly attraction and makes for a pleasant way to spend a morning or afternoon. Previously known as Boon Rawd Farm, the fertile soil here was used to grow barley for beer production and the farm was off-limits to the general public. That all changed when Boon Rawd decided to transform the area into a sustainable tourism project with Singha Park opening its gates to visitors in December 2012. Large areas of the park are still a working farm with fruit orchards and tea plantations as well as some of the original barley fields. These days though, the barley is mainly used for malted drinks and health foods. The farm is now more famous for its production of oolong tea and tours of the park provide visitors with the chance to see how the tea is grown and carefully picked. 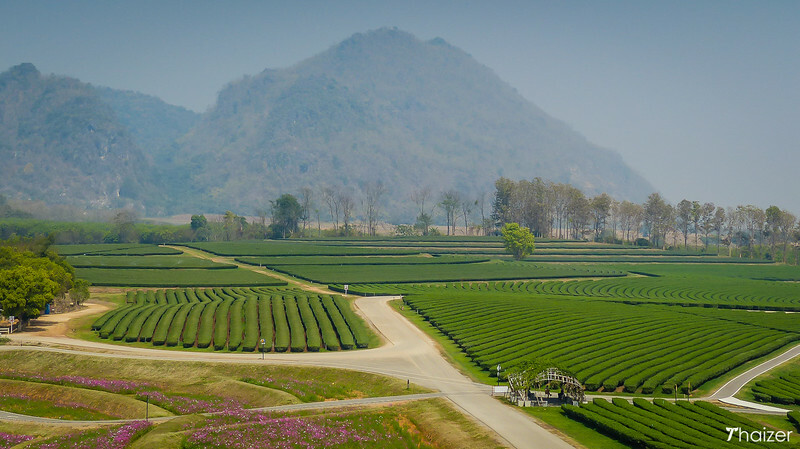 The park has also been sympathetically landscaped with trails, lakes and meadows all combining to make this an attractive destination for people in Chiang Rai. 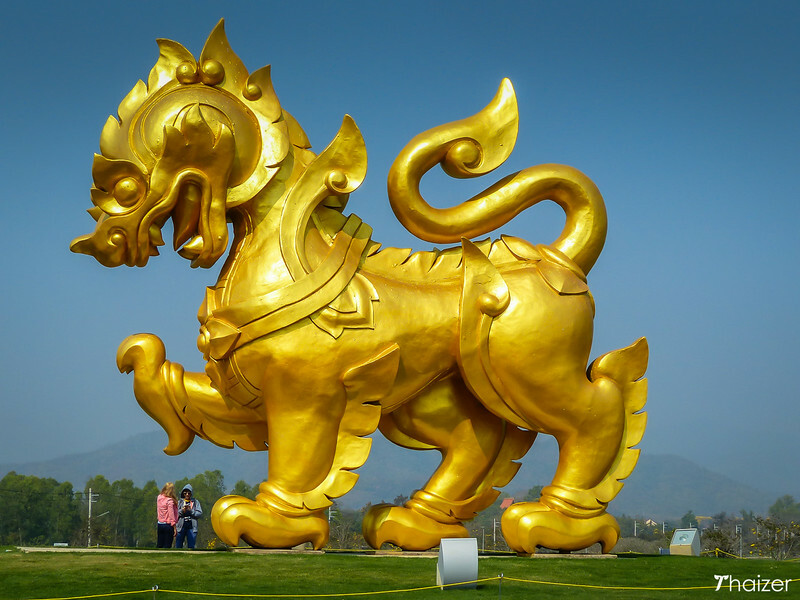 The distinctive golden Singha logo dominates a small mound at the entrance to the park providing Thai visitors with the obligatory selfie opportunity. 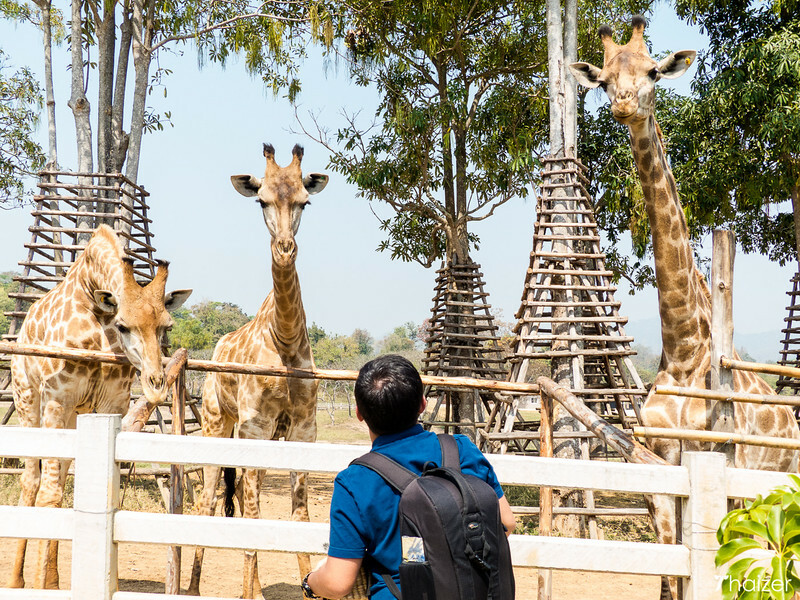 As an agro-tourism destination, Singha Park works closely with schools and colleges in Thailand with Thai youngsters forming a large percentage of the visitors during the week. At weekends the park is particularly popular with local cyclists and Thai families who come here to enjoy the wide open expanses and scenery. The word ‘Singha’ is actually pronounced ‘Sing’, but some Thais are so used to hearing it called ‘Sing-ha’ by overseas visitors that they may even use this name too without trying to correct you! If you listen carefully to Thai people ordering a Singha Beer, you should be able to hear them say ‘Beer Sing’. The park covers a large area and although you can walk around the pathways closest to the entrance, if you want to explore more of the landscaped grounds the Singha Park staff encourage visitors to use bicycles or take the electric tram. The tram stops at various points of interest and gives you time to enjoy the walking trails and flowers. 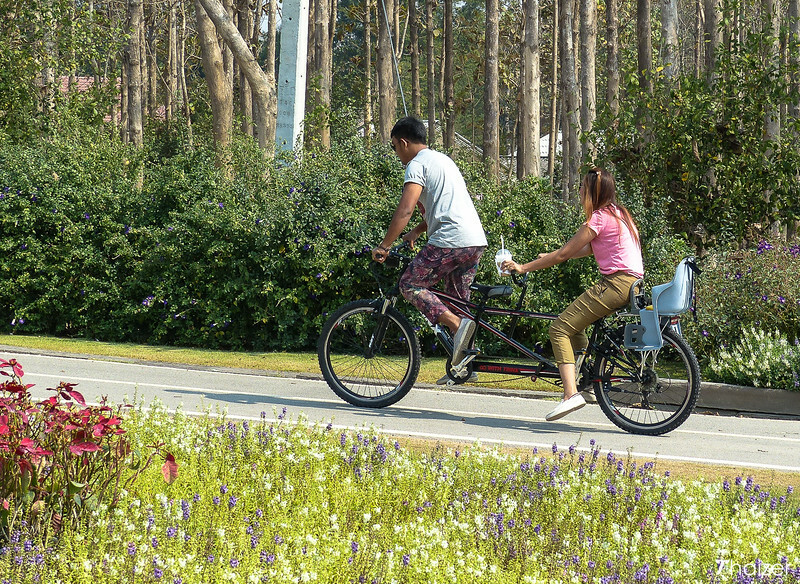 The bicycle routes in Singha Park are excellent and are free to use if you bring your own bicycle. 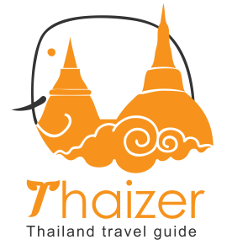 If you need to hire a set of wheels, a tandem will set you back 150 Baht, a mountain bike is 100 Baht and a children’s bike is 50 Baht. Prices are per hour an include the use of a bicycle helmet. An hour will give you enough time to explore most of the park whilst two hours should be ample for a leisurely ride and plenty of stops for photos. There are various cycle paths to choose from with informative maps telling you the length of the ride in kilometres and the degree of difficulty on each route. Please note that all cyclists are asked to register at the bike desk before setting off on any of the routes in the park. An electric tram carries visitors to various parts of the park with stops at the fruit orchards, tea plantations and the petting zoo some of the highlights. Tickets for the tram are purchased at the information counter near the front entrance. On busy days (especially weekends and holidays) you may have to wait at least an hour for a seat on the next available tram. There are coffee shops and food outlets where you can sit and wait or you could just opt to hire a bicycle to save time. The price of the tram is 50 Baht for adults and 25 Baht for children, but does include two vouchers which can be exchanged for bottles of water at the refreshment stops on the route. A guide accompanies the tram, but at the time of writing announcements are only made in Thai. Trams run at least every half-hour from 10am-5pm. 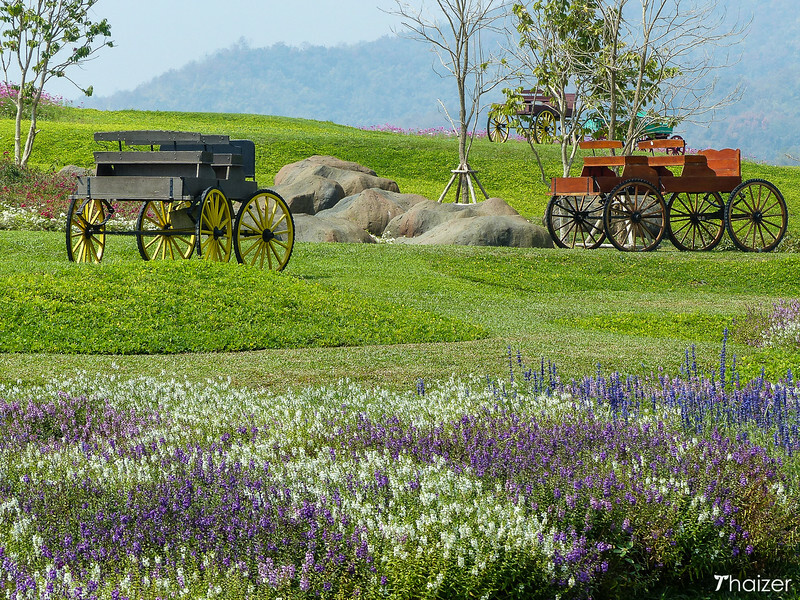 There are a number of attractions at Singha Park which make it suitable for visitors of all ages. 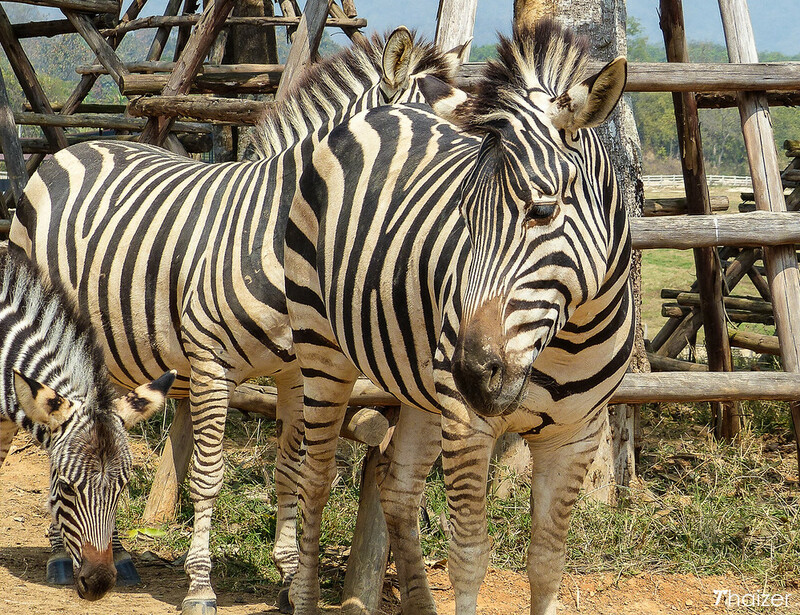 Young children will probably enjoy the petting zoo most of all with the chance to feed the zebras and giraffes. There are also a number of locations around the park where visitors can pick their own fruit and vegetables or simply enjoy the walking trails through the meadows. For something more active, ziplining and wall climbing are both available. Whilst the setting is scenic, it’s a steep 800 Baht per person for the privilege of a short ziplining flight to take in some of the panoramic views from above. The climbing wall costs 150 Baht per person. If you’re looking to do something active at Singha Park, hiring a bicycle provides the best value and most reward. The best place to eat at Singha Park is the highly regarded Bhu Bhirom Restaurant. With an elevated position and expansive views over the park and plantations, the restaurant is a lovely place to dine and relax with a choice of Thai food, including northern Thai specialties, as well as Western food. 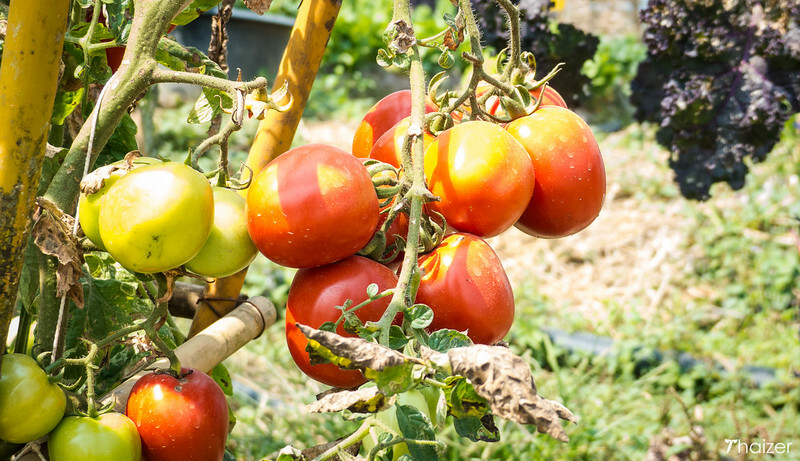 The restaurant uses freshly grown fruit and vegetables from the farm. Bhu Bhirom also incorporates oolong tea leaves into the menu with signature dishes such as the spicy tea-leaf salad. And if you have a taste for tea, stop at the Singha Park shop and buy some packs of the locally produced oolong tea leaves to take home with you. 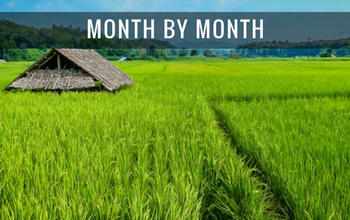 Bhu Bhirom Restaurant is open daily from 11am-10pm. In addition to Bhu Bhirom Restaurant, Singha Park hosts a number of very good coffee shops and the popular Barn House Pizzeria for pizza and beer (opens daily from 11am-8pm). There are also a number of local restaurants and food stalls outside the park opposite the main entrance. Throughout the year, Singha Park stages a number of music concerts with some big name Thai bands pulling in the local crowds. The park also hosts an annual balloon festival in February and various cycling events during the year. The main part of Singha Park is open daily from 9am-6pm although restaurants are open until later. Entrance to the park is free with visitors paying extra depending on how much they want to see or do when they are there. I’ve enjoyed my trips to Singha Park and whilst I wouldn’t describe it as a must-see attraction, it is an interesting and attractive destination and one that sees far more Thai visitors than foreigners. 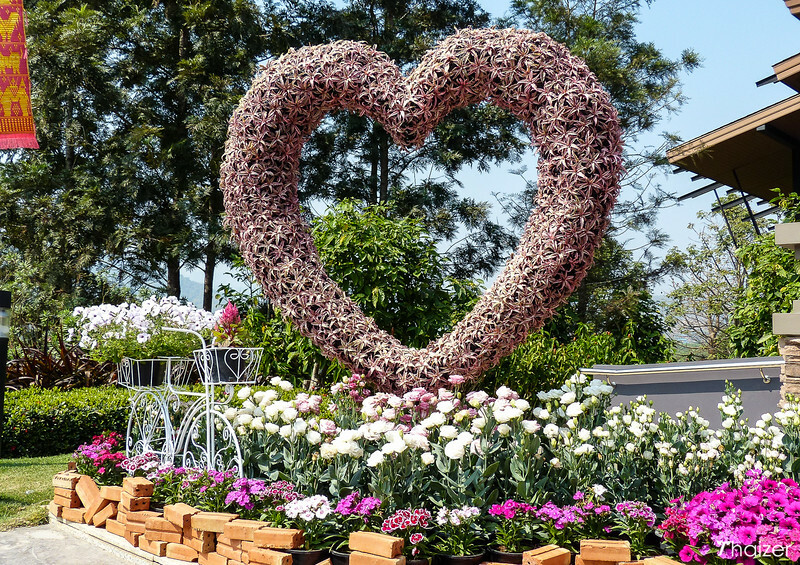 It’s well worth spending a half-day at Singha Park especially if you have your own transport and can combine it with a trip to the nearby White Temple (Wat Rong Khun) which is approximately 10 minutes away by car. The park is open all year round, but is at its blooming best during the cool season from mid-November to the end of January. From mid-February to the beginning of April, the haze and smog can detract from some of the views. 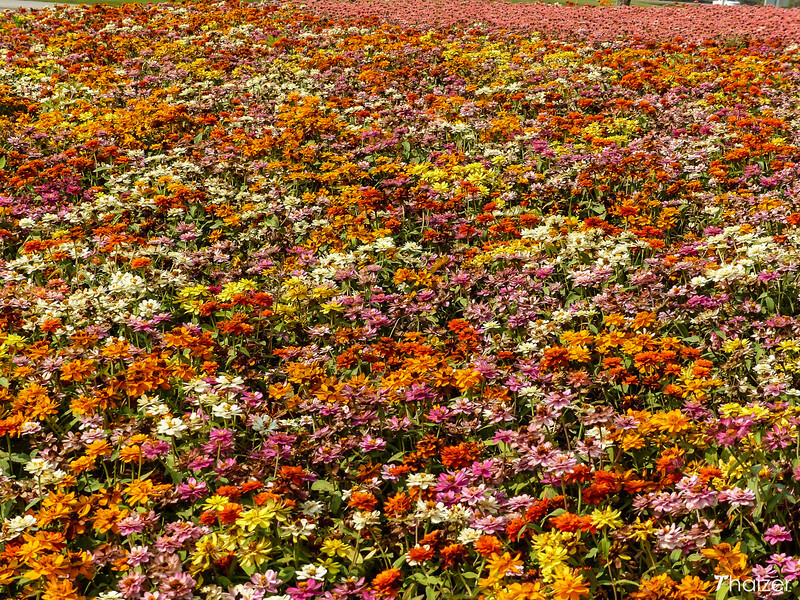 Singha Park is located approximately 12kms to the south-west of the centre of Chiang Rai city. The main entrance to the park is located on Den Ha-Dong Mada Road (Route 1211). 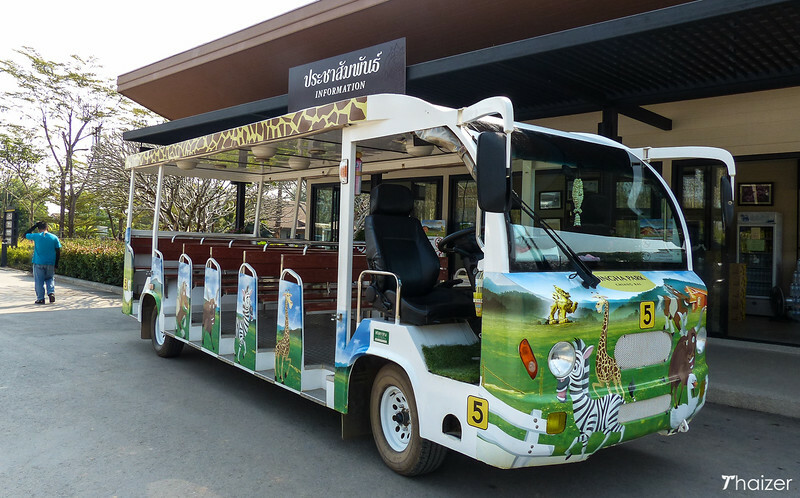 There is currently no public transport that goes directly to Singha Park although the owners have said they may introduce a shuttle bus from downtown Chiang Rai at some stage in the future. 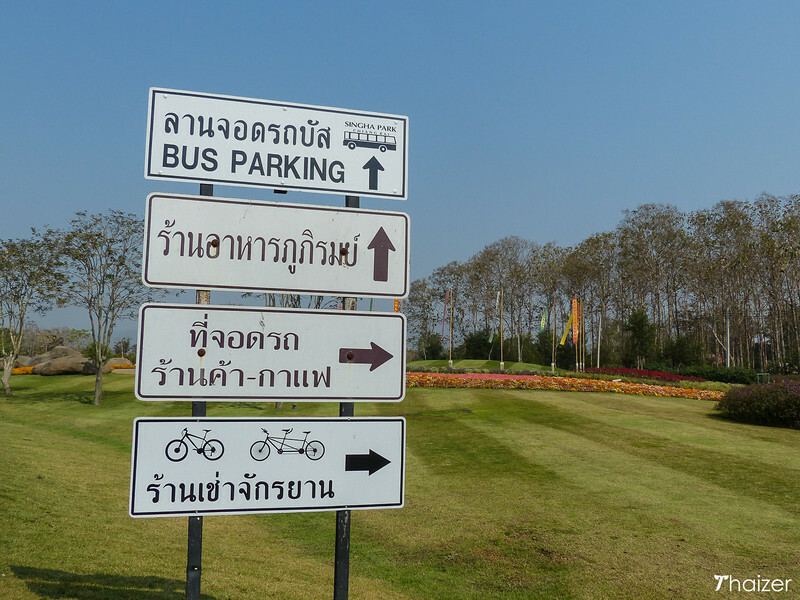 For the moment though, the easiest way to get to Singha Park is with your own transport. Cars and motorbikes can be hired by the day in Chiang Rai city centre. Another option if you’re reasonably fit is to hire a bicycle in Chiang Rai and cycle out to the park. 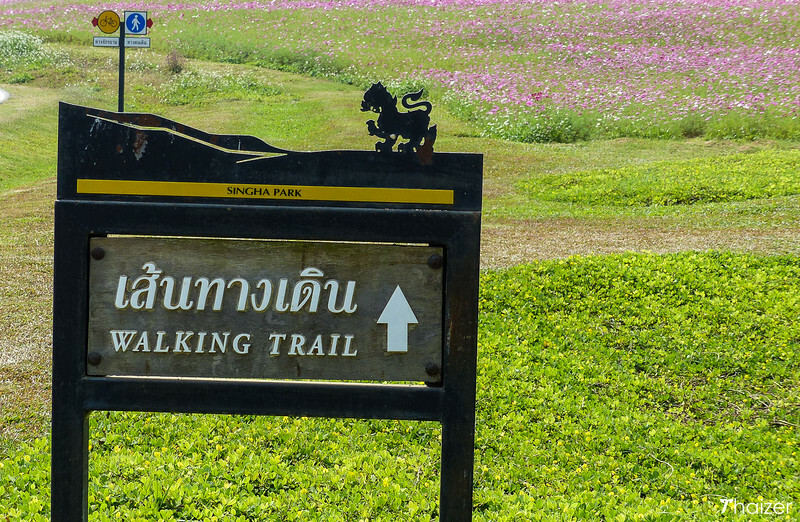 Singha Park features on some shared tour itineraries, but it’s best to explore the park at your own pace. 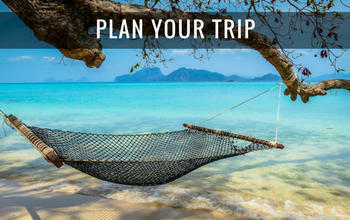 Enquire about prices for shared or private tours of Singha Park at any tour office in Chiang Rai city. 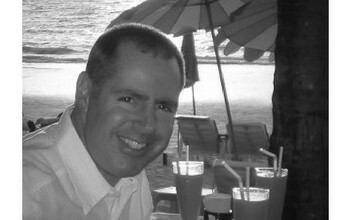 You can also try negotiating directly with a songthaew or tuk-tuk driver. 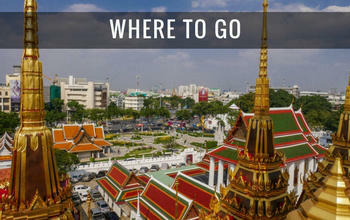 Taxis will also take you there and back, but are likely to ask for a set fare to take account of the waiting time. A trip to the park can also be combined with a visit to the White Temple (Wat Rong Khun) and your driver may suggest this.